Crestwood Companies was founded in 1996 in Washington, D.C. by David Bernstein. Crestwood Homes builds exceptional custom residences in metropolitan Washington, D.C. today. As a third-generation homebuilder, David Bernstein has construction in his blood. 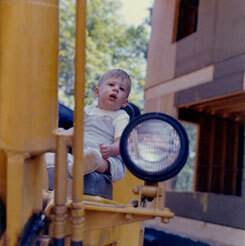 A photo of David at age one sitting on a front-end loader tells the story of how he learned the trade of fine home construction working with his father building homes in the suburbs of Washington DC. After graduation from North Carolina State University, David wasn’t content to take his father’s recommendation that he go to law school and instead joined the family firm. As a condition to joining the business, David’s father insisted he learn from the ground up, his first assignment being in charge of processing building permits. In a 10-year period, David worked his way through the ranks of his father’s company ascending to Vice President and Partner. This experience afforded David a multi-dimensional, dynamic understanding of the construction business. In 1996, David confidently set out on his own, focusing on custom residential construction. He’s never regretted following his family’s legacy. For David, building a home that is in sync with its environment while meeting the desires and dreams of a homeowner is, in itself, creating a legacy of art. To achieve this successfully David says, “You must have good relationships with customers, with subcontractors, with county planning and building departments and even the neighbors adjacent to the project”. He takes pride in his practice of being a hands-on builder that oversees all construction directly and interacts with his clients through all facets of the building process. This process can take up to two years from planning to completion and requires a close working relationship, not unlike a marriage; good communication, patience, and commitment are essential. David prefers to build fewer homes per year so that he may give that personal attention and achieve the quality that he pursues. It’s what sets Crestwood Homes apart from the others.